Explain the significance of Shay's Rebellion. After the Revolutionary War, the United States was all of the following except...? The Articles of Confederation made the federal government very powerful. Samuel Adams was so dissatisfied with his role as a delegate in the Continental Congress that he abruptly resigned and headed home. Why was he so unhappy? What does the word depreciated suggest in the excerpt above? Soldiers were very appreciative for the 20 pounds they received for their services. During the Revolution, many farmers began to borrow money from creditors so they could grow more food to meet the high demand, yet somehow they ended up as debtors. Explain why this occurred. By 1786, debtors made up 80% of the occupants of prisons in Worcester (sounds like Wooster), a major Western Massachusetts town. Why was losing your farm not only an economic decline but also a loss to your status in the United States? Contrast the western people and the eastern people of Massachusetts. Hint: Boston is a part of Eastern Massachusetts. Think: Who were the western people? Who were the eastern people? How were they different? What was Daniel Shays' mission? Was he successful or not? Explain. What did the Militia Act state? If a militiaman was in need of a shelter, you had to vacate your home for them to stay in. Every male over the age of 16 had to serve in the local militia. Courts could call a local militia to defend themselves from the Shaysites. If you were in a militia and rebelled against the government or stopped a court, you could be put to death. The Riot Act of 1786 stated that 'if more then 12 people got together for any purpose that the government construed as negative' they could do all of the following except...? Samuel Adams took George Washington's advice to talk to the rebellion leaders and figure out what their issues were. What was Daniel Shays' plan when he heard that Lincoln's 4,400 mercenary army was headed to battle his 2,200 men? What went wrong for Daniel Shays and his men? Did every delegate just agree on something?!?!?!?! What did they all agree on? Federalists wanted all of the following except? What was the result of the Constitutional Congress? 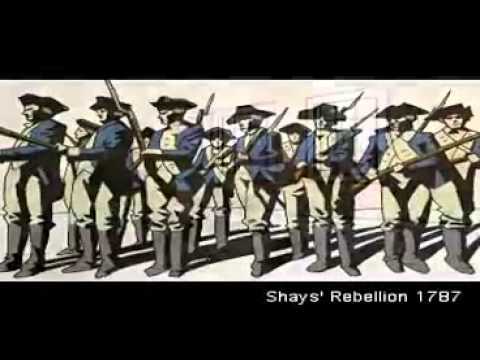 What was the direct result of Shays' Rebellion? Reflect: What do you think of Daniel Shays, his rebellion, and its outcome?